In 2009, Mark teamed up with his colleagues at A123 Systems and Schneider Electric to produce a no-nonsense book about how real change can be orchestrated in a company. In doing the background work for the book, what became clear to all the authors is that what is written about organizational transformation is relatively thin and narrowly focused. In addition, many of the tough areas of leadership that are critical to transformation are typically glossed over or ignored in the literature. Executing Your Business Transformation is a no-nonsense book that deals with subjects that are not often addressed with the level of directness and candor found between the covers of this book. Here is a short introduction. Based on the authors' decades of experience dealing with major business transformation, this book provides valuable guidance for any company contemplating mergers, acquisitions, or a major restructuring of your business model. Many organizations undergo transformation with lots of enthusiasm, but are frustrated with the results. This book contains a set of lessons gained in the process of working in and with organizations in the process of transformation. Diagnostic questions and a set of recommendations for every lesson are provided so the reader can apply the lessons to their own situation. ​Today's marketplace requires that businesses maintain excellent relationships with their customer base while offering a greater range of options – often combining services with traditional product offerings. 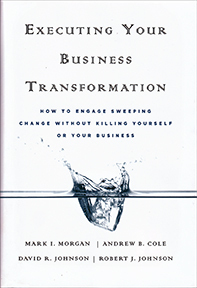 While many organizations enthusiastically attempt to undergo transformations to accomplish this and other major changes, they are often frustrated with the results.Executing Your Business Transformation provides valuable guidance for companies contemplating mergers, acquisitions, or major restructurings of their business models. This important resource is based on the expert authors' decades of experience dealing with major business transformations and offers an illustrative set of lessons gained from the authors' wide range of experiences.Some of the unorthodox and yet highly valuable lessons in the book include Your customers are always right, except when they aren't; What got you here may kill you there; There is no strategy if nobody knows what to do; Consultants are not an excuse for not knowing your business; Yesterday's leadership skills may prevent tomorrow's success; and Transforming strategy requires more than expensive software. With keen insight and rare candor, Executing Your Business Transformation provides thoughtful advice to any leader who understands that the strengths of today's company will not translate into the results of tomorrow.